If Charleston is to be resilient to future flooding, we must commit to understanding the multi-faceted problem. We know the issue is not only related to sea level rise. The amalgam of causes also includes geography, frequent extreme weather-related events, increased precipitation, higher groundwater tables, antiquated infrastructure, subsidence and more. All contributors to flooding in our city are and will continue to be monitored and evaluated. Flooding is caused by many factors, which often combine simultaneously to form a complex, multi-faceted challenge. 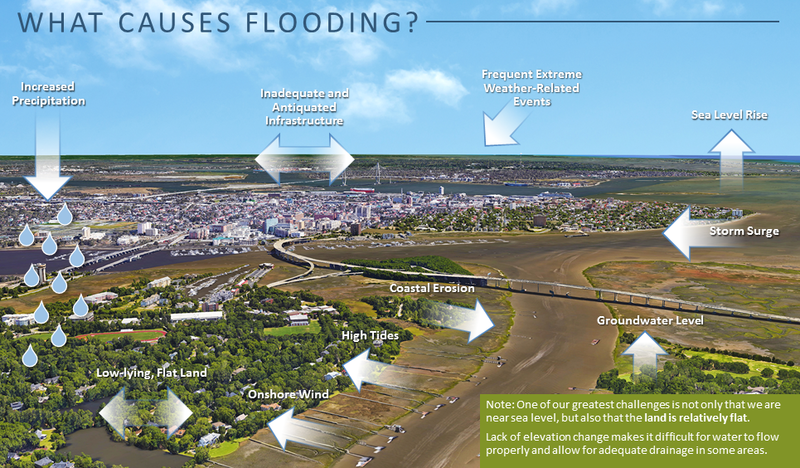 LEARN MORE about why Charleston floods when it rains. LEARN MORE about how high tides affect our drainage systems.